– Use a search engine to drive traffic to their site. 6. Allow people to download software or e-books from your website at no cost. Just ask your visitors in return if they’ll refer their friends to your website. 8. Create multiple streams of income with your website. You could sell your products, join affiliate programs, sell advertising space, etc. 10. Give your visitors compliments for your ad copy. This can earn their trust and put them in a good mood, in return they will be easier to sell too. 11. Take risks to improve your business. Sometimes businesses don’t want to advertise unless it’s free, sometimes you have to spend money to get results. 12. Include emotional words in your advertisements. Use ones like love, security, relief, freedom, nice, satisfaction, fun, etc. 13. Ask people online to review your website. You can use the comments you get to improve your website, or you may turn the reviewer into a customer. 14. Outsource part of your workload. You’ll save on most employee costs. You could outsource your secretarial work, accounting, marketing, etc. 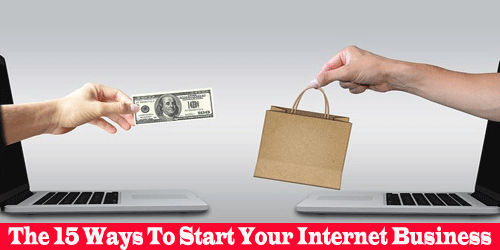 0 responses on "15 Ways To Start Your Internet Business"